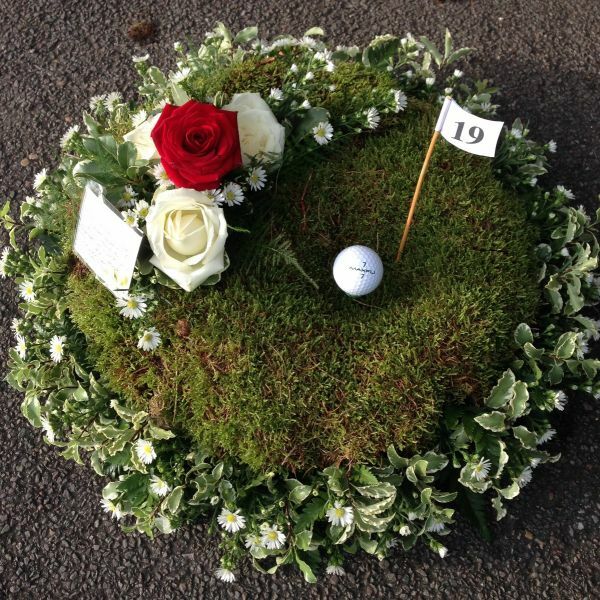 A simplistic golfing tribute representing the hole in one of the golfing sport. finished with a flag, golf ball and rose cluster. Due to seasonal availability and supply factors, individual stems may vary. On occasion we may be required to make seasonal substitutions which we endeavour to do with flair and consideration to the original colour scheme, without compromise to the overall design of the arrangement. Where delivery to the Funeral Home is requested, we will liaise directly with the Funeral Director on your behalf to make delivery arrangements in keeping with the timings of the funeral arrangements.